The names of the council of ministers have been finalised by the state Congress leaders, including Gehlot and Pilot, after rounds of discussion with Rahul Gandhi and other senior leaders. Jaipur: Rajasthan Chief Minister Ashok Gehlot will expand his Cabinet on December 24, Monday. At least 23 ministers are likely to be inducted in Gehlot’s cabinet. The new ministers will be administered the oath of office and secrecy by Governor Kalyan Singh at Raj Bhawan in Jaipur. Chief Minister Ashok Gehlot and Deputy Chief Minister Sachin Pilot, who took oath on December 17, returned to Jaipur on Sunday afternoon after spending three days in the national capital. Both Geholt and Pilot were having a meeting with Congress president Rahul Gandhi and senior party functionaries. The names of the council of ministers have been finalised by the state Congress leaders, including Gehlot and Pilot, after rounds of discussion with Rahul Gandhi and other senior leaders, sources said. The swearing-in ceremony is expected to be held in Jaipur at 11.30 AM. Those who are likely to take the oath are BD Kalla, Raghu Sharma, Shanti Dhariwal, Lal Chand Kataria, Pramod Jain Bhaya, Parsadi Lal Meena, Vishvendra Singh, Harish Choudhary, Ramesh Chand Meena, Bhanwar Lal Meghwal, Pratap Singh Khachariyawas, Udai Lal Anjana, Saleh Mohammad and Govind Singh Dotasara. Mamta Bhupesh, Arjun Singh Bamaniya, Bhanwar Singh Bhati, SukhramVishnoi, Ashok Chandna, Tikaram Jully, Bhajanlal Jatav, Rajendra Singh Yadav and RLD’s Subhash Garg are also likely to take the oath. 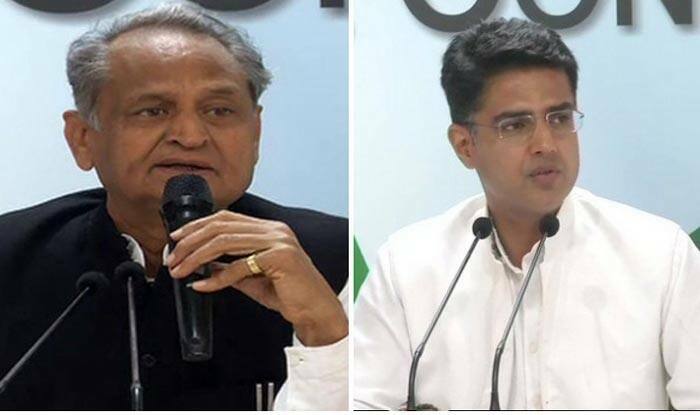 AICC general secretary in-charge of Rajasthan Avinash Pandey and Congress observer for the state on government formation KC Venugopal, besides AICC secretaries for the state, were also involved in the deliberations for deciding on the ministers, the sources said. In the recently held Assembly election, the Congress won 99 seats and enjoys the support of six BSP MLAs and lone RLD MLA. The BJP had won 73 seats in the 200-member House. However, the election in Ramgarh constituency was postponed due to the demise of BSP candidate Lakshman Singh. After results were declared for the Rajasthan Assembly polls earlier this month, there were long deliberations on who will be the next chief minister. While Gehlot had been a two-time chief minister earlier, Pilot was the state unit president and also the young face of the party.